Taiji Dolphin Action Group members on Facebook were hopeful when the dolphin hunters returned to work on January 5th 2012 that they would not find dolphins, or would simply abandon this inhumane hunt that has caused millions of dolphins a slow deaths in The Cove. The volunteers on the ground were a star studded cast of dedicated dolphin conservationists, Enson Inoue Martial Arts Champion and Ric O’Barry creator of “The Cove” were just a few who showed up, everyone playing their parts. Apparently when the boats first went out they located a small pod that they released: Sea Shepherds “Taiji: the 2 boats have abandoned the found pod. All 12 boats back on patrol. #tweet4taiji. The small pod may have been Risso’s Dolphins a species that has been driven into the cove again and again this winter. According to Ceta-Base, 202 have been taken this so far leaving a remaining 73 Risso’s dolphins during this season http://www.ceta-base.com/drivefisheries.html. 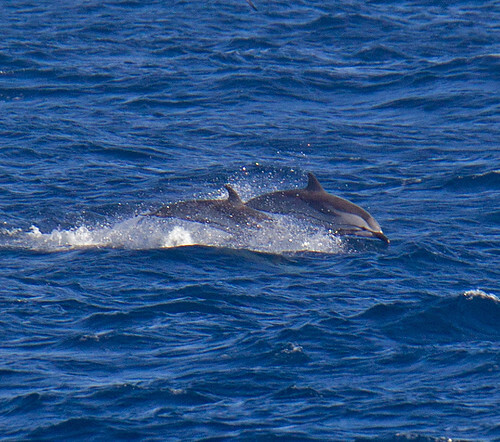 The horror began as the Sea Shepherds reported Taiji: the dolphin killers say they have a pod of 200 Striped dolphins. #Tweet4Taiji. The beautiful and powerful striped dolphins known to panic in the cove were being pushed into Taiji’s cove of death and suffering. Mothers, Fathers, and their children ran for their lives as the killers pushed on, Sea Shepherds, “Taiji: the pod originally stretched out over a mile. Some have escaped. The unlucky ones are being driven closer to the cove. #Tweet4Taiji“. 40-45 dolphins were driven into the cove and under the blue tarps of death where the killers hide their shameful acts of violence slaughtering dolphins slowly as seen in the Dieter Hagmann video secretly obtained from under the blue tarps during 2010-2011 hunting season. Although strong the striped dolphins would be no match for the killers. One lone dolphin escaped but his efforts were of no avail as a dolphin killer shoved his blow hole under the water out of the view of watchful eyes as pointed out by Save Japan Dolphins volunteer Heather Hill, ” The final lone dolphin was not cooperating with the skiffs and resisted swimming towards the now bloody beach. A diver approached the dolphin and when it tried to flee, he grabbed hold of it. The dolphin was clearly extremely stressed by this contact and made a mad dash towards its family, under the tarps and out of our sight, towing the diver the entire way. His hand was placed over the dolphin’s blowhole, and I wondered if he was trying to keep it submerged and out of our sight.”http://savejapandolphins.org/blog/post/two-views-of-todays-dolphin-slaughter. Another tragic ending for the people of the sea in the bloody cove of Taiji. The people of the sea, their lives wasted so their toxic flesh can be sold to unsuspecting customers. Hardy Jones director of Blue Voice. org continues to bring the focus back to the toxicity of the dolphin meat due to Mercury, PCB’s and other toxins http://bluevoice.org/news_dolphinmeat.php. When will this senseless killing of the monarchsof the sea end in Taiji? Every day awareness grows worldwide as more people join to end this senseless slaughter. Please join us as we continue to fight for our oceans and her people, cetaceans. Your voice is needed. Together we can make a difference. This entry was posted in Cetaceans, Dolphins and tagged Hardy Jones, Japan, Ric O'Barry, taiji, the Cove by Kirsten Massebeau. Bookmark the permalink. These DOLPHIN KILLERS come off like they own the southern ocean in Antarctic and they own the dolphins in Taiji. Your day will come trust me. I have a good feeling this will end. We the people are never giving up on these intelligent beings.You capture them in a cowardly act as if you own them. When your IGNORANT,UNEDUCATED AND HEARTLESS TO THE CORE THE ANIMALS BECOME THE VICTIMS. Your dirty secret is out and the whole world is on to your evil deeds. PRESSURE,AWARNESS AND NEVER GIVING UP DOES WONDERS!! The money you made over the years off of these poor souls, you will be paying on hospital bills on yourself and your love ones.GOD BLESS THE DOLPHINS THAT WILL CONTINUE TO DIE INTO THE EVIL HANDS OF TAIJI!!!! I don’t get it. Why are dolphins still being killed if the dolphin meat market is down?? I heard the fishermen are not makin much profit, due to the mercury japanese are not buyin it. So again WHY ARE DOLPHINS STILL BEING SLAUGHTERED?? Please reply back. Taiji is still holding Erwin Vermeulea to set an example,thinking this will scare all the activists away so the KILLERS could continue thier DOLPHIN SLAUGHTER!!! Fat chance of that Taiji. We the people will NEVER GIVE UP EVER ON THESE INTELLIGENT BEINGS. I will continue to send donations, sign petitions, spread the word and call the Japanese embassy. What ever it takes to save these MAGNIFICENT CREATURES WE THE PEOPLE WILL FIGHT TO THE END!!! Taiji fishermen you have not be to nice to these intelligent beings of the sea. You were raised to have no regard for these defenseless creatures. WHAT A COWARD YOU ARE!!! 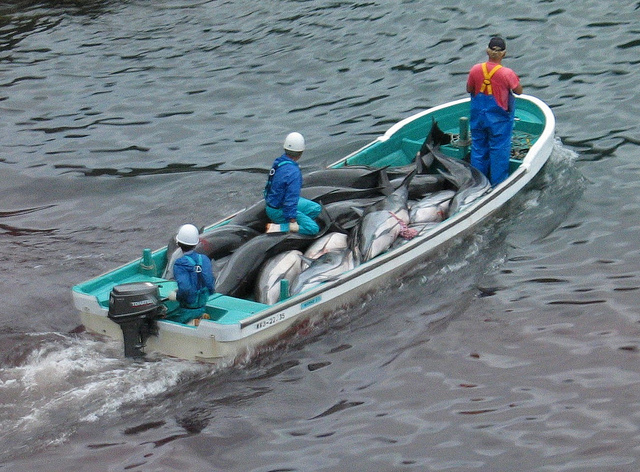 How dare you take the life of these dolphins in a cowardly way, for that you must pay. As a matter of fact Mr. Ishii once said you fishermen when you die you will come back as a dolphin.So your tatic with Erwin won’t fly with us. GOD BLESS THE DOLPHINS THAT WILL CONTINUE TO DIE INTO THE EVIL HANDS OF TAIJI!!! Taiji is a town to be “BACKWARDS” ” UNSOPHISTICATED” one activists was right when he said the fishermen are total losers. It’s obviouis thier not going to stop. They were raise to disrespect animals. They look at these dolphins to be big fish with blow holes, but yet knowin they could make money off of them. Thank you guys/gals for not giving up on these intelligent beings of the ses. I have faith this will end one day with constant pressure and awareness. I just sent another dontation to Sea Shepherd. The dolphins are worth it, they suffered way to long in Taiji it’s time we repay them back with love and protection. GOD BLESS THE ACTIVISTS AND DOLPHINS THAT WILL CONTINUE TO DIE INTO THE EVIL HANDS OF TAIJI!!! I feel bad for Ric O’barry. I been watchin his latest videos the sad and Lonely dolphins, and you could just see the pain in his eyes. I’m hoping this cove gets shut down before he leaves this earth. And i know in my heart of hearts that’s what he wants. This man is working tirelessly to saving these poor creatures. I’m prayin every day and nite for the activists and the dolphins to end this cruelty once and for all. I know in my heart and soul when God decides to take Ric he’ll be in heaven with all the Taiji dolphins around him and his beloved Cathy at his side thankin him for his hard work in saving dolphins. But hopefully he’ll live to be 100 yrs. old,and his son Lincoln will follow his footsteps. Thank you so much Ric and all other activists for being the voice for these intelligent beings of the sea. And i have faith that one day this evil cove will end, cause Ric and all the other activists would not have it any other way. You guys/gals are doing a great job lets keep on fighting for these beautiful creatures. GOD BLESS THE ACTIVISTS AND THE DOLPHINS THAT WILL CONTINUE TO DIE INTO THE EVIL HANDS OF TAIJI!!!! RIP. @Kirsten Massebeau: I forgot to ask When was that film taken and who were the people filming it? Please reply back when you can. thank you. Diane, Save Japan Dolphins volunteer Leah Lemeux took the video. @Kirsten Massebeau: I just watched Whales Blessings of the sea. It gave me a glitter of hope that with pressure and persistence this evil cove will be stopped eventually. Thank you Sea Shepherd, Cove Guardians and all other activists for doing a tremdoues job in exposing the evil acts of these men that we call humans. The film told me that these fishermen are concered of the exposure of the slaughter and how the townspeople will hate them for it. It also told me that the Taiji community does not know about this cove. I am so proud of Scott West and other activists for standing up to those fishermen. I will continue to send donations whatever it takes to save these intelligent beings of the sea. Our efforts will pay off one day and never give up on these creatures. Thank you again for that footage. GOD BLESS THE ACTIVISTS AND THE DOLPHINS THAT HAD DIED AND WILL CONTINUE TO DIE INTO THE EVIL HANDS OF TAIJI!!! Diane, “Living with Whales” also game me hope for the future although I can see we need to change some things about our approach. Change must come from within and the only way to create a dialogue with the people of Taiji and all of Japan is to adopt an ultra-polite stance much like the Japanese. I don’t get it, why is this slaughter still happening? The Cove movie has been out since 2009, it baffles me that this is still gone on. Is this ever gone to end? I can’t go to Taiji but what ever it takes to save these creatures i will continue to send donations. I don’t care how the money is spent, PLEASE!! PLEASE!! PLEASE!! let this senseless slaughter end. The dolphins deserve our love and pretection, it’s time that we repay them back. GOD BLESS THE ACTIVISTS AND THE DOLPHINS THAT HAD DIED AND WILL CONTINUE TO DIE INTO THE EVIL HANDS OF TAIJI!!! Diane there are many issues at play in Taiji all of which are economic. The captures support the slaughter. They hunters are well aware of what people think. Change must ultimately come from inside Japan so let the dialogue begin so we can “End It”.